Buddha’s guidelines for community living. 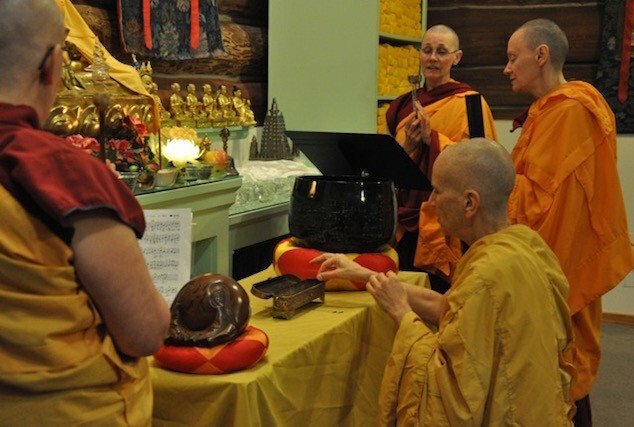 Three sangha ceremonies make the Dharma grow strong. We do them at Sravasti Abbey. While they are not public, we want to tell you about them. It’s something to rejoice in. “Living in Vinaya” means living according to the monastic code of ethics, behavior, and governance set up by the Buddha. Observing these three is the mark of a fully functioning sangha community. Where four or more fully ordained monastics do these practices, the Buddha’s teachings can flourish. The Abbey is one of very few such sangha communities in the United States. By practicing these rites, we strengthen the sangha and fortify the flourishing of the Dharma. Choosing Simplicity by Vinaya master Bhikshuni Wu Yin, edited by Bhikshuni Thubten Chodron, gives a thorough teaching on the role and responsibilities of fully ordained nuns. You can learn more about aspects of the Vinaya and about Buddhist Nuns on ThubtenChodron.org. The Abbey presently has 10 fully ordained nuns (bhikshunis)— very rare in the U.S. It is especially unusual within the Tibetan Buddhist tradition. Possibly because of dangerous travel conditions, the full ordination lineage for nuns was not established in Tibet. However, the lineage flourished in China. Abbey nuns receive their full ordination in Taiwan. A fully ordained monk is also part of our community, and we welcome male trainees. We look forward to sharing the Abbey with a bhikshu sangha of four fully ordained monks someday. 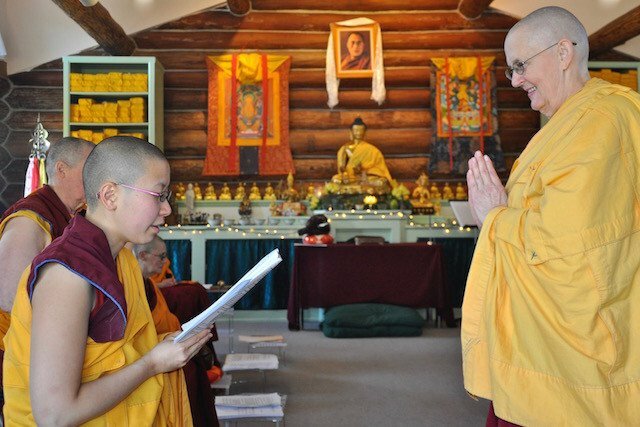 By taking full ordination, monastics assume the responsibility to continue Buddha’s teachings in the same complete way that they have been passed down to us. Posadha is the confession ceremony held on new and full moon days when we purify and restore our monastic precepts. Doing posadha (sojong in Tibetan) together reminds us of our values and gives us the opportunity to restore broken precepts. This regular self-examination helps us recognize where we are in our practice and supports our growth. The annual varsa is a three-month monastic retreat. In ancient India, it was held during the monsoon rain season and called a rains retreat. We do it in winter as a “snows retreat,” a variation that the Buddha allowed. During varsa we study Dharma and especially focus on harmony in the community. The winter varsa overlaps with, but is distinct from, the annual winter meditation retreat. The rites to enter varsa are ancient. There is an incredible sense of peace when we do these slowly, mindfully, thoughtfully, and with delight in being together as the sangha. We end our varsa with the pravarana ceremony. Also ancient in origin, the pravarana invites feedback from the community about our conduct during the varsa. The purpose is to guide us with love and compassion to strengthen our good qualities and diminish our faults. Pravarana builds trust and connection in the community. The kathina ceremony is another ancient ritual the Abbey has adopted. Kathina invites participation from the lay community in a special festival that marks the end of the varsa retreat. Kathina is widely celebrated in Buddhist countries of Southeast Asia. It’s a time when lay followers can make offerings of the four requisites—food, clothing, medicine, and shelter—to replenish the monastery’s supplies after the long retreat. 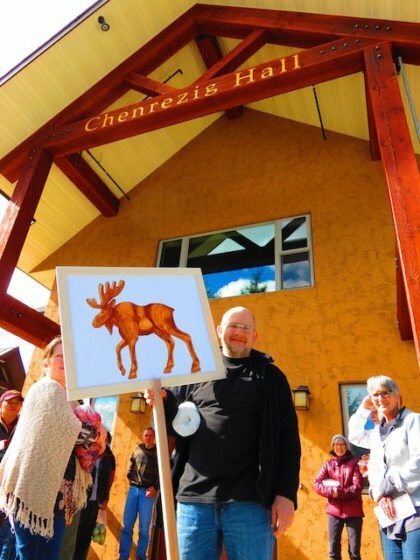 The sangha accepts these offerings, and ceremonially offers a “robe of merit” to a worthy monastic to symbolize the great merit the community has generated from taking part in the varsa. 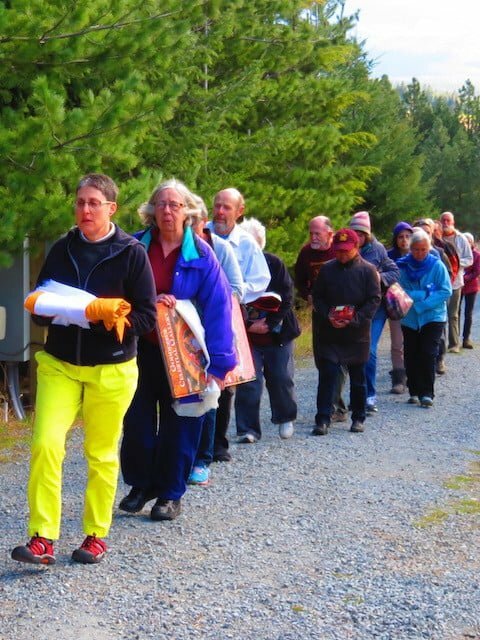 Marked by a shared meal, procession of offerings, chanting, and Dharma talk, kathina reconnects the sangha with the lay community after the long winter retreat.